You may have come across the acronym “RTW” lately (especially if you’ve been reading travel blogs) and one of my predictions for 2010 was that you’d see many more airline RTW options and plans. For those of you who may not know exactly what an RTW is or the culture behind it I’d like to introduce you to the three letters RTW. Simply put, RTW stands for round-the-world and in the travel community it usually means a trip around the world. The length and route of these trips vary quite a bit, with the average being a year trip across destinations in 3-6 continents (sorry Antarctica). People who travel around the world for a year or so can be considered RTWers when there is a planned beginning and end to the trip. There are many others who travel indefinitely, but typically RTWers are those who’ve taken a career break, purchased a round-world-ticket (many airlines offer them), and set off using savings or working from the road to pay for the trip. RTW Tickets can range from $2,000-$5,000 dollars using an RTW trip planner. AirTreks has an excellent RTW trip planner. Many RTWers don’t permanently leave their jobs. Briefcase To Backpack is an excellent resource if you’re contemplating a career break. For those of you who are curious about RTWers you can catch some of them mid-trip by checking out the following blogs written by travelers on RTW trips. RTW doesn’t really have a set meaning, although there is a general idea around it. I suspect the phrase will find itself in the broader lexicon eventually as more people take RTW trips in the coming years. Some RTWers only travel for few months, focus on a particular part of the world, or break the trip up into segments. Others start off on a RTW and never make their way back and just keep traveling. Are You A Past, Present, Or Future RTWer? It would be great to hear from those of you who’ve had the RTW experience as it’s unique to everyone. 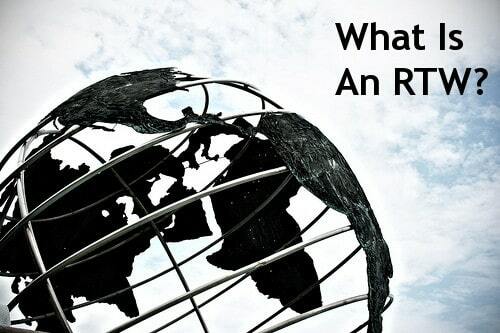 Your comments would help explain the concept of “RTW” much better than I alone and perhaps be encouraging to those who didn’t know such things existed (or that so many people do travel around the world). If you still don’t think it’s possible or how to go about it, my eBook Overcoming the 7 Major Obstacles to Traveling The World can teach you how. NextDid You Keep Your Travel Resolutions For 2009? Well I can’t seem to stop talking about it, but I am a Future RTW-er. I’m planning a RTW trip that will start in September and encompass parts of Oceania, Asia, The Middle East and Eastern Europe. I’m chronicling my planning and my actual trip on my blog. I’m not sure I would classify my trip at a career break exactly. This is in part because I don’t yet have a career I’m particularly passionate about. I’m hoping it will be more of a catalyst for bigger better things once I return. There’s probably a lot of gap year (before and after) RTWers as well. Where in the Middle East are you planning specifically? Definitely Egypt and then on to Turkey, but the rest is still up in the air. I have a friend who is applying for a Fulbright in Syria so if she’s there I will be paying her a visit and maybe doing some travels with her. Sounds cool. I’ll be in the Middle East this winter with Syria, Israel, Jordan, Egypt on the list. Maybe our paths will cross! thanks for including us in your list! I’d really add Audrey and Daniels http://www.uncorneredmarket.com to the list. The photography is stunning. It’s a truely great blog. Read it to quick. They’re not true RTWers but still a great blog! I’ve known quite a few RTW-ers, but had no idea they were called that- or even knew that expression (RTW). This post was fascinating- It would be wonderful to do a real RTW- I think the closest I came was when I drove from India to London and then flew to Singapore via the Middle East- then flew from Singapore back to India …but then that wouldn’t count because I missed South America. My husband and I (including our children) are future RTWers. We are planning to take our kids RTW some time within the next 5 years (when our kids are older). We plan to go for a minimum of 6 months to a maximum of 1 year, covering South America, Asia, Australia & Pacific, and Africa. I hope we make it!!! I’m sure you will, no doubt! What a cool experience for the kids. Love this insightful post on RTWs and RTWers! While I’m more of a nomad, I am captivated by the idea of a RTW. The RTW trip is really enticing. I think with some good marketing more people would do them, especially the 6 month variety. Thanks for shedding some light on this great form of travel. AirTreks has been enabling people to take RTWs for 23 years, and the number of travelers doing them has never been higher, even through the recession. Your post the other day focused on people pushing the comfortable borders of Europe. It was very telling. 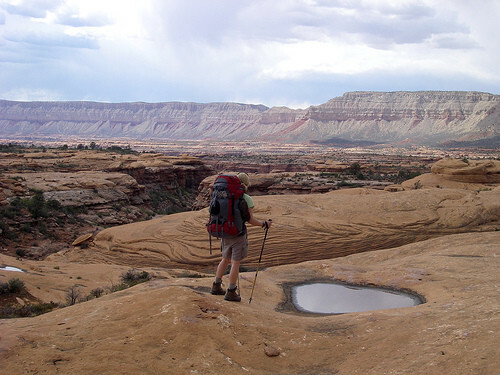 More and more people have realized that there’s a vast landscape of sights and sounds out there to see, far more than what our parents saw when they went abroad. 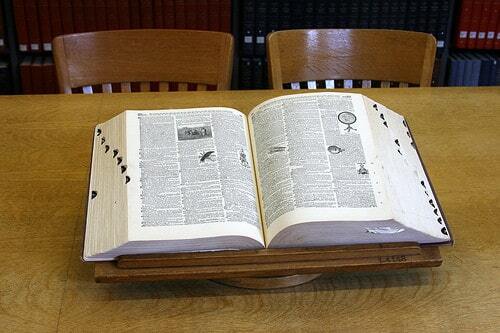 The world is only getting smaller and the ability to receive an encyclopedia of knowledge in one trip is unprecedented. It’s cheaper, easier and less unusual now than ever has been to travel around the world. If more people know what RTW travel did for their life, health and mentality (and photo albums), I’m sure they’d be booking tickets post-haste. You’re right Nico, it’s a cheaper and easier now more than ever. RTW trips I believe are a few television commercials away from becoming a big industry in travel. Thanks so much for including us Anil! Great post & I agree this is a growing trend! We’ve been on an open-ended, non-stop family RTW journey since 2006. The world is large & there is soooo much to see, so we took friends advice (who had done RTW trips in a year), and added on time…& keep adding on time. LOL! 4 continents, 32 countries, & over 175,000 miles (most overland) so far & still so much to see, I don’t see any end in sight yet. Slow is also MUCH cheaper ( we only spend 23 dollars a day per person) and more rewarding and compatible with families. Plus no RTW travel burnout! We love it too as a freedom & educational lifestyle. We’re not typical RTW’ers but I think more and more will become atypical as tech,economy reset & 4hww ideals are changing how we travel and live. Today one can live & school ANY where, so that can’t help but change travel & RTW trips. This year ( & into next) we will make a full circle ( more typical RTW) but only because we want our child to immerse deeply in Mandarin Chinese (her 3rd language)next winter. It’ll be fun, but I still prefer focusing deeply on a continent at a time. I always think of RTW as someone who is attempting to tour around the world. Not just flying around the world like on a business trip, but actually stopping and getting to know parts of the world as they go. Yours is one of the first websites I think of when long-term travel comes to mind. I wonder if after RTW grows does slow travel come next? The pieces for many people are there, it’s affordable, and many jobs are portable. Anytime – love your blog! I was going through my links page the other day and checking up on a few travel blogs that have gone quiet, many of them in the middle of the RTW trip. It’s hard to maintain and once you get back most don’t have a reason to keep blogging. It’s usually just a way to stay in touch for most. LOL! Heather- I think slow RTW might seem alien, until you do it and then it feels very natural as it allows you to follow your bliss without deadlines. Like a place? Stay longer. Tired of intensity? Chill out for a while. It’s not uncommon for us to find a place that we meant to stay a few days, but love it so much that it stretches out to a month or more. We still do short, intense trips. We packed a LOT in to our short trips to Norway, Costa Brava etc. But instead of going home to rest, we carry our home with us and rest as we go. After an intense phase we rest and recover in comfy spots. (This also keeps our budget VERY low…doing a long leisurely stint in expensive Norway makes no sense, while doing a long Scandinavian stay in our friends country cottage in Sweden does!). It is impossible to blog everything in real time & a RTWer (especially the slow variety) tends to pack decades worth of travel experiences into a year. Thus, they should have tons to write about if they don’t go too fast so that it all becomes a blur or spend all their time partying with hostel buddies. If we did not travel another day, I have infinite unique stories, books, videos, photos that I’d need a few lives to pass it all on. I think people stop because it’s a lot of work & little ROI. Great post as usual, btw! Sustaining a blog during an RTW must be difficult. I struggled enough in times past with a diary that you could write anywhere and needed no more than a pen and paper. I like the parallel of slow travel and long term travel – how people can manage this helter-skelter approach to travel over a long period mystifies me. I don’t think I could maintain a travel blog well as an RTWer, at least not with this posting schedule. Mark and Anil, Sustaining a blog while traveling is pretty tough for two reasons: (1) finding Internet, and (2) finding time to write. On the first point, we try to work on pictures and write the posts in Word so that we can spend as little time as possible on the Internet. Luckily, Southeast Asia seems to have great Internet facilities — unlike Australia where we often struggled with Internet that was as slow as using a dial-up modem. On the second point, we set aside time specifically each week to work on the blog and call it “down time.” It actually keeps us enjoying our travels more because otherwise all the tourist sites start to blend in together and we end up running from one place to the next rather than slowing down and enjoying the countries. At the same time, I only post twice a week because that is feasible for us. I use Microsofts LiveWriter to help me write the posts, add pictures and format the blog entirely offline. Then, once I have a connection I can just upload it, schedule it and be done. It has made it totally easy!! Thanks for the tip Gillian, I hadn’t heard about LiveWriter, I’ll have to get a trial copy to play with it. I had been researching for some WordPress plugins to see if it might be possible to write posts offline (using Google Gears) but nothing I found looked like a good solution. I would like to put myself into this category, although im not sure if i’ve quite earned the title yet of a RTWer. I have travelled New Zealand, and about half the countries in Europe, with a view of finishing the other half this year, then maybe travel to Australia. Hi Dan, so are you splitting the trip up out of a home base or working as you go? Checked out your blog, seems like you’re focusing on a section of the world at a time. I’m with you – don’t need to see it all at once! The simplest definition of a RTW trip is crossing both the Atlantic and Pacific in one trip. Stops being optional along the way and using any method of transportation you like. Some do it by car or boat. Most obviously by plane. I’ve heard of people walking or biking and then taking a boat to cross the oceans. But the most important thing is to get out there and do. It’s not intimidating once you have the knowledge of those who have done it before you. Nowadays round the world is easy. Imagine doing it 50 or 100 years ago. It just seems crazy or impossible for most since they assume you’ve got to be rich or eccentric to do it. 5) And here’s the big benefit: you can change your day, date, and time of fight (not your destination) as many times as you want without penalty, as long as seats are available. I tried to change my date a couple of times but found it to be exceedingly difficult because I had booked through US Airways. Since USAir served few of the places I wanted to go, most of my legs were booked though partner airlines. Not only dd USAir not have offices in the cities I visited, when I did get through to them from international destinations, they insisted that changes must be made with the airline through which I was ticketed. However, when I called those individual carriers, they insisted I needed to do it through USAir. Typical “one hand didn’t know what the other was doing” scenario. Currently, Star Alliance has 25 partner airlines. Next time, I’d probably book through the airline that served the most cities I wanted to visit. Star Alliance offers four levels of R-T-W ticketing, each one with a different number of miles. For the normal R-T-W fare you can choose a maximum of 29,000, 34,000 or 39,000 miles. There is also a special economy R-T-W fare for 26,000 miles. I chose the 39,00 mile ticket, which cost me slightly more that $5,000, if I recall. Although this may seem pricey, consider that it took me to SE Asia, Indonesia, New Zealand, Australia, and Africa & North America; a regular ticket to Africa can cost a couple thousand dollars. I traveled 38,999 miles, so I put it to good use. My best tip for figuring out a route is to find the main ports on each continent, which are often in places you wouldn’t expect (Zurich and Frankfort in Europe, rather than Paris or London). Fly into the major ports and then do alternative transport (buses, trains, or shuttle flights with low-cost carriers) outside of your R-T-W ticket. Otherwise if you try to book flights to all your destinations within a continent using the R-T-W mileage, you’ll eat it up quick and won’t be able to get to al the destinations you want to see. Lastly, your R-T-W ticket can be applied to the frequent flier mileage account of the airline through which you book, so if you’re not already a member, become one before booking. Then, make sure to save all your boarding passes to prove you took the flights, because your booking airline cannot access the computer of member airlines to confirm that you actually flew each leg. USAir gave me a lot of trouble about crediting my account, but I sent in my boarding passes with a written request for mileage and it was eventually credited to my account. Hope those tips will help peopple considering a R-T-W. It is really an awesome program. Wow, Barbara, looks like you certainly got the most you could out of your RTW ticket, that’s great! Sounds like an awesome trip. And I’m glad you paid attention to the details because a lot of people go to the airlines for RTW tickets (and lay down serious money) without knowing all their options. I actually wrote an interesting post just recently comparing the airline alliances’ RTW tickets and those purchased though consolidator services like AirTreks. Barbara, thank you very much for the very informative comment. I know that a few people had emailed and asked me about RTW tickets, options, etc. and I can now point them here. You’ve done an excellent job of laying down what people what to know the most with some great tips. Research is important I think with offerings (of any service really) that isn’t one of the most common. I can imagine if you leave it up to the airlines they’d book you in a route that’s not close to the most efficient. Wow, I am impressed that you got 38,999 out of a 39K ticket. Perfect… I too have run into the argument about who owns the ticket but invariably it ends up with the airline who you bought the ticket from so choose carefully. hi anil, great post and thanks for including as, it’s a gladly surprise. It’s easier to blog if you travel slowly. I’m making my way around at one region at a time but if I were on a year or 18-month RTW I’m pretty sure keeping up with this pace would be impossible. You guys have done a petty good job of it so far, the next hurdle is after the trip! Anil thanks for giving a shout out for career breaks and http://www.briefcasetobackpack.com – thanks for helping us start the revolution in the US! One of the reasons we started BriefcaseToBackpack was because when I was planning my own RTW trip in 2005 as part of a career break – and there was so little information about how to make it happen. In fact when I was planning everything, the travel blog industry was in it’s infancy and I mainly used Bootsnall as a resource to help plan things like insurance, tickets, subletting my apartment, itineraries, etc. It was there that I learned about Airtreks! I used Airtreks to book a multistop ticket for my first 3 months of travel to get me started. I actually opted not to do a RTW ticket as I didn’t want to be locked in to anything. However the Airtreks multi-stop tickets are also a great option. A lot has changed since 2005 and I feel like the number of people taking RTW trips is increasing which is great to see – but I still feel like Americans really lag behind – thanks to our views on our careers mainly. Hopefully we can start to change that too! Your post has some great info and comments that hopefully inspires everyone! And if you need a little inspiration, then read about other people who have taken career breaks and RTW trips on Briefcase to Backpack! Thanks Sherry, I think the working culture in the US really needs a shift. In the States the attitude on travel is that it’s a luxury and one people can afford to give up or refrain from. Combined with the (generally) small amount of vacation time per year most don’t get a chance to really see the world. The difference with Europeans, for example, who travel more and have longer vacation times comes down to what they demand. The people demand from their governments and often receive in return (with a few strikes here and there). I’m of the mindset that Americans really demand too little from their employers and governments – there’s no reason more people shouldn’t be able to take career breaks – and thankfully there’s now much more information on how to do it. Amazing how much can change in a few years! Thanks, as well. I think you’re one of the quintessential RTW success stories! Happy travels and great luck with the website! I have to second Sherry and say thanks for including us in this post! I’d also like to jump in on the conversations related to the difficulties of keeping a blog during your RTW travel. It is a great way to stay in touch with family and friends, but I think it can also take away from the travel experience, especially if you are traveling on a career break seeking to open your mind and open doors to new opportunities. I personally understand the pressures you can get if you go a period of time without posting updates – and it’s hard to deny those back home sitting in a cubicle the amazing experience you had hiking Machu Picchu or the dare you accepted to try cricket in Cambodia. But I think it is also important to keep a travel journal to help realize how these experiences are helping you on your path to self-discovery. Plus there are some things you don’t want to share with the world, but you certainly don’t want to forget. And when you are sitting at home years later flipping through your journals, they will help bring back great memories (and laughs) but also help you see how far you have come. Thank Michaela. Although most don’t start out this way, looking back on it now, I think it’s best to start a travel blog with a purpose and direction in mind. You can of course change (mine wasn’t always a travel blog) but when you take a career break, travel RTW, and start a travel blog it can all be overwhelming. Most RTW blogs get going full time after the trip not during. I like the approach you described, being disconnected a bit and focusing on exploration. You might end up seeing more that way plus you’ll get to plan another long trip 🙂 I love the Mediterranean region, culture, and food – worth staying a bit extra. Anil, Thanks so much for including us on this list! It is great to see so many future RTWers commenting. I think it is one of the best decisions we have ever made. Will we at some point convert from plain old RTWers to long-term travelers like Audrey and Dan? I sure hope so. In the meantime, we love what we are doing and like that you showcased so many different people doing RTW trips in so many different ways. Great post, as always! Thanks for including me Anil. I’m a future RTW traveler. I’ll probably do more than oen RTW trips in my lifetime. All the curretn RTW travelrs are a great inspiration for me. They keep my hope alive that one day I can be like them. Thanks for mentioning us Anil. It’s great to see so many future RTWers reading along – it really is possible!! Thanks Anil! We hope others are inspired to plan and head out on a RTW! Good post. Any tips on Egypt? We are at the planning stages of our Middle East portion right now. G’day from New Zealand! Any time, I love reading your site 🙂 Where in Egypt are you going – just be aware at the Pyramids where there’s a lot of commotion and people trying to sell you things (more so that usual) and have your best bargaining face on. Everything is negotiable! Thank you so much! I’m having a blast following your RTW and glad you’ve been able to keep up with the blog as you travel from place to place. Thank you for your blogs! They are so insightful, inspiring, and really well written. I heard about RTWing a while back and have since been saving up little by little to do this. Since I heard about it, I’ve been spreading the word. When I bring it up, it’s usually a 50/50 chance that people will have heard of this or not. I would absolutely love to go for a whole year and am considering combining it with some WWOOFing. I’m just curious, what are some ways that travelers continue to earn money while on their trip? Thanks! My pleasure Amerly and thank you very much for kind words. There are many ways to make money when traveling but I’d first start with your current job, what do you do now? Perhaps it may be portable, at least in some part. Other than that it’s easy to turn a variety of skills into freelancing jobs, sites like Elance.com are good places to create profiles and look for some side work while you travel. I hope this helps some but let me know if you’d like more details, I’m happy to help.